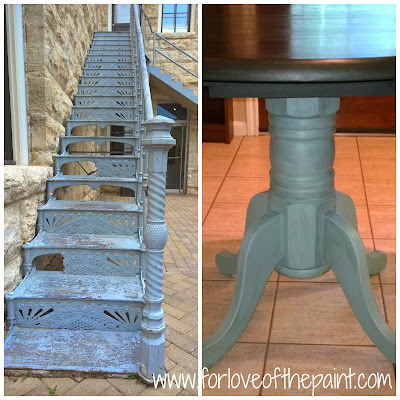 I'm super excited to begin sharing some of my inspirations behind the colorful refinishes I've been working on. I am so blessed to be able to enjoy the beauty of nature and outdoors, and have been able to capture a few of those moments on film.. well ok, digitally. I'll be adding some inspirations to my before-and-after posts, but also have a few projects that don't have their own posts, so I'll share them here! Be sure to click on the "Color Story" label to see more! 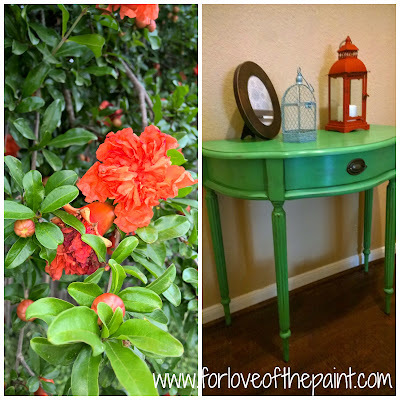 First, a gorgeous Bombay console table painted in Annie Sloan Antibes green (over a shimmery cola color by Martha Stewart interiors), distressed, and with clear and dark waxes. Here's a gorgeous Duncan Phyfe style vintage desk we picked up at a garage sale, and totally transformed with Annie Sloan Emperor's Silk! This one was also sealed with clear and dark waxes. 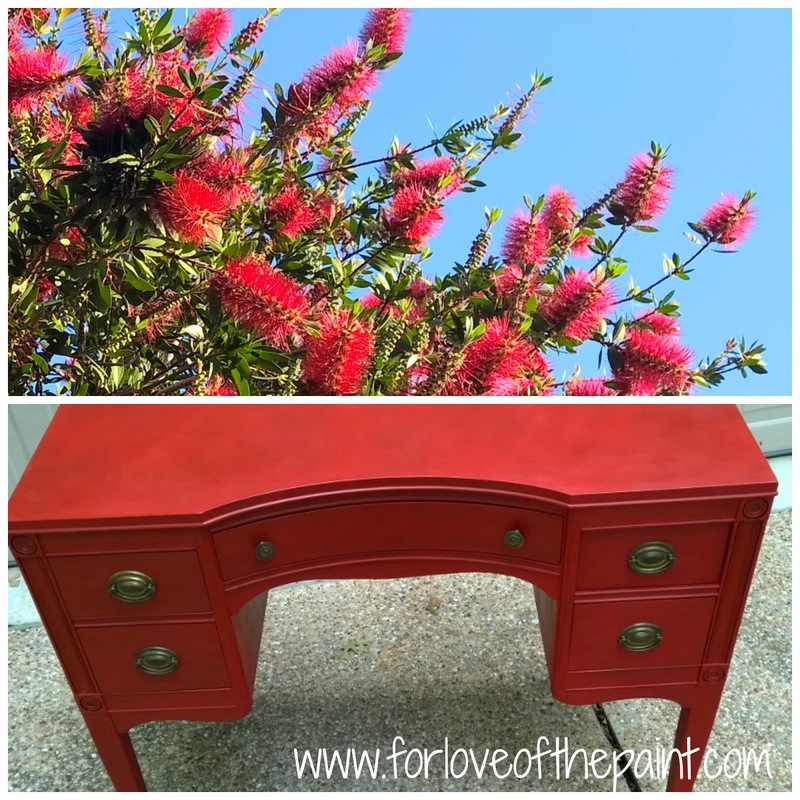 I am just totally obsessed with the bright red bottlebrush plant, and this desk turned out stunning as well! Blue and gray make incredible Color Stories! Here's a drop-leaf pedestal table that I just loved, with Duck Egg Blue and a wash of Graphite. The top was done with solid Graphite, and straight dark wax. Note: There's a very different look to Graphite with clear wax, clear and then dark wax, or straight dark wax. You would never use dark wax without clear wax, except with Graphite for an extremely dark finish, or it would stain the paint underneath! And have I mentioned, I LOVE this blue staircase? It's rustic, weathered, and just... gorgeous. Check out my Instagram for more inspirational photos @forloveofthepaint! I'll keep adding more projects as I come across ones that have yet to be uploaded, but don't forget to "Like" me on Facebook for behind-the-scenes snapshots, tips and tricks at www.facebook.com/forloveofthepaint! Also follow me on Instagram @forloveofthepaint to see what's inspiring me today!